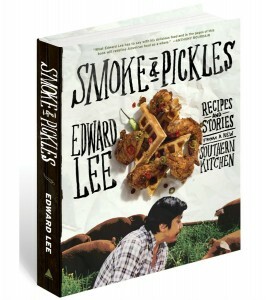 Excerpted from Smoke & Pickles by Edward Lee (Artisan Books). Copyright © 2013. Photographs by Grant Cornett. Perhaps you’re a Korean barbecue fanatic already and you have several jars of kimchi in your fridge. (Quick test: when you pick up The Barbecue! Bible, does the page open to 520—or Planet Barbecue! to page 50?) Or perhaps you’re looking for some explosive new flavors for your next pork shoulder or beef ribs. Well, I’ve got just one word for you: kimchi. This turbocharged Korean pickling process has electrified barbecue around the planet. I asked Edward Lee, author of Smoke & Pickles and Iron Chef America-winning chef/owner of 610 Magnolia and MilkWood in Louisville, to show us how this popular Korean pickle can help take your barbecue over the top. In the last decade, kimchi has grown from a misunderstood ethnic dish to a trendy condiment loved by chefs the world over. The spice and sourness of kimchi cuts through the fat and salt of grilled meats. That balance of umami to acidity has not gone unnoticed. The acceptance of kimchi as an essential partner has given it a starring role alongside everything from hot dogs, porchetta, and burgers to the iconic barbecue of the American South. And yet, there is still much to be learned about kimchi. It was introduced as a fiery napa cabbage pickle layered with garlic, ginger, fermented shrimp, and lots of chili powder. But that is just one variety in a category that includes hundreds of recipes. In my book, Smoke & Pickles, I point out that there are limitless versions. The term “kimchi” is not the name of one dish. Rather, think of it as a verb. 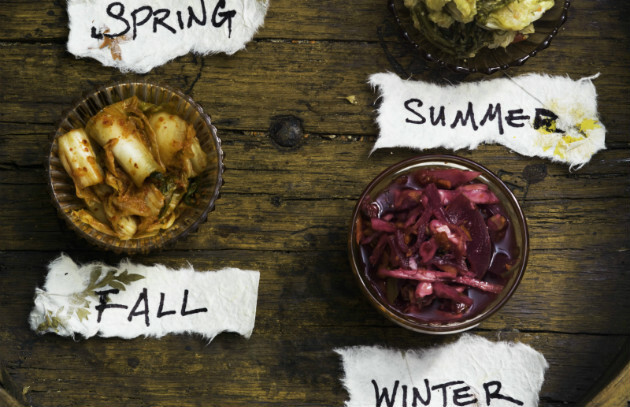 You can kimchi anything: cabbage, cucumbers, radishes, oysters, even fruit. It is the fermentation that makes it a kimchi. And that process can change with the seasons just as our grilling techniques change. As soon as spring arrives, I am out on the patio grilling burgers. There is something magical about burgers on a grill during the first days of a new spring. Its bounty of new shoots and greens—overwintered spinach, ramps, green tomatoes, young lettuces, garlic shoots—makes for creative kimchi that I use to top my burgers. Most of these are short-fermentation kimchi, no more than a week or two so the vegetables retain their crunch, color, and vibrancy. Summer is a great time for water kimchi, which is a category of pickling that uses cucumbers or daikon radish in a salty, sweet consommé. They are light on spice and big on brightness, almost like a palate cleanser. These clean-flavored kimchi recipes are perfect for thin, quick-grilled beef and chicken, the smokier the better. The bite of the char is cooled by the refreshing tartness. Fall has typically been the time when cabbage is harvested to become the gingery, garlicky napa kimchi bright red from lots of chili powder. Another wonderful tradition in fall is to make red kimchi with large chunks of daikon radish. The taste may be similar to that of napa cabbage, but the texture is crunchier and heartier. Typically, this is when the most kimchi would be pickled and jarred to last through the winter months. By winter, most of the red kimchi that was put up in fall will have become overripe and very pungent. Too overpowering to eat raw, this kimchi is perfect for stews and soups redolent with the flavors of miso, winter vegetables, pork, and bone broth. But there’s really no reason to stop grilling just because we’re indoors. Cast-iron griddles are a great substitute for an outdoor grill. I like to portion my steaks a little thicker, use a spicier rub, and achieve a blacker crust. I pair these steaks with one of my favorite varieties: purple cabbage kimchi. This is a much heartier version of the red napa cabbage kimchi and it turns a dazzling purple color that brightens the monotone plates of winter. Try this creative version, which will prove how dinner always gets more interesting when kimchi meets the grill. Get the Red Cabbage–Bacon Kimchi recipe. Edward Lee, chef/owner of 610 Magnolia and MilkWood in Louisville, Kentucky, is a three-time James Beard Foundation Award finalist for Best Chef: Southeast. An Iron Chef America winner who competed on Top Chef: Texas, he stars in PBS’s “Mind of a Chef” beginning in September 2014. Smoke & Pickles is his first book. Follow him on Facebook, Instagram, and Twitter at @chefedwardlee.